I'd just like to remind y'all of this... Remember, kids - monopolies are only bad if others do it! But when Tim does it 10x worse - it's ok! In a strict sense - no. Would they like one? Probably. Are exclusives monopolizing which storefront to use? Yes. 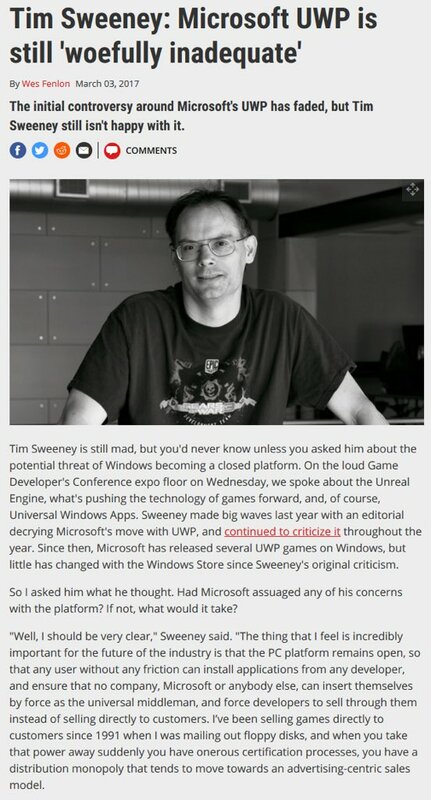 MS Store was something he didn't like and moaned about, and MS was not even bribing the devs. I just see this as two-faced. Oh it's absolutely two-faced, just not monopolistic. To be honest though, I just don't see what choice Epic has in the matter if they want to have a successful storefront. If the Epic store had literally the exact same feature set as Steam, everyone would still choose Steam as they're embedded in the ecosystem. They need compelling reasons for users to go there. They've got compelling reasons for developers but have kind of failed on the consumers. Ideally Epic would fund the development of actual exclusives, and maybe that was their plan but Fortnite accelerated the launch of their storefront. Hard to know, but it seems a safe bet that moneyhatting games won't be a tactic forever for Epic. Another reason why Fortnite is toxic. I still can't believe they made 3 billion in a year on that F2P game... What the hell are their playerbase doing there??? They could, you know, maybe try fighting Steam by giving consumers some more favorable deals than Steam can? Hoarding exclusives doesn't help one bit, they just stand to make a monopoly of their own, and we, the consumers, receive no benefits whatsoever. We still have one choice and one place to spend our money at, same as it was with Steam. At least we'll have discount console wars on PC if nothing else. That's something to look forward too I guess. At least we know they're for profit through pro developer features.